– Quickly view your recent water usage with a two week comparison. – View detailed water usage history by day, week, month, & year. Step by step to start using our Eyeon water program. Log in to Meadows Place online account. USER DASHBOARD click View Daily water use on the right of the user dashboard. 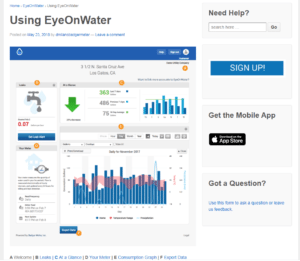 Sign up for new EyeOnWater account as prompted. Sign in to your new account! The help icon at the top of the web page shows how to set alarms and shows you EVEYTHING on how operate Eyeon water – Call Ymica Davis with Meadows Place Utilities for assistance.